Edmonton helps seniors to be involved in the community and provides access to senior centres, support groups and many other programs and services. Age is a gift. The City of Edmonton values all individuals who bring it to us. We are committed to seniors so that they have access to programs, employment, activities, services and buildings that help them stay safe and engaged in city life. 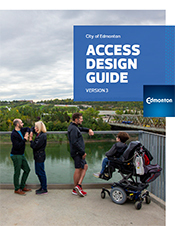 Attributes and criteria for the City to follow in order to have a truly inclusive and supportive Edmonton for citizens. Learn about housing programs and services available for seniors in Edmonton. Learn about our transportation resources and information hubs across the City. The Edmonton Seniors Centre Strategy project is an opportunity for Edmontonians, of all ages, to consider what healthy and active aging means for seniors centres. Edmonton is part of a global movement to make cities friendlier for people of all ages. In partnership with the City of Edmonton, Age Friendly Edmonton and Alberta Health Services, Home for Life™ has emerged as an initiative leading the way for life-long residential home design.